It is quite possible that a large share of the readers of this blog will never practice urban planning in the UK. But the document that is commented is interesting in comparative terms and by its enunciation of public policies (a literary corpus in itself…). The European Union is composed of countries with very different legal traditions, usually grouped in two families: southern countries have usually Latin origin systems, highly codified, while the Northern Countries are rather based on the Germanic law tradition. In the case of the British system there is a tradition of Acts passed by the Parliament and of documents exposing the policies of the current government. The electoral platforms, considered as mere political marketing tools in the Latin countries, can gain in Britain a certain legal status without going through the Parliament (although usually subject to public consultation). 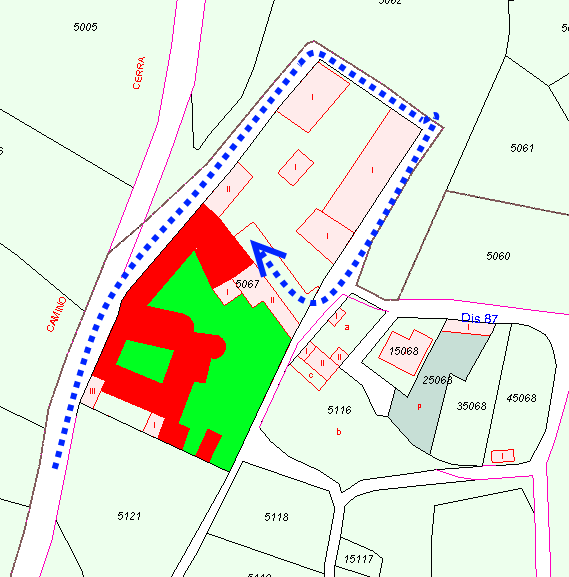 So are formulated the Planning Policy Statements and other documents compulsory in a variable degree. 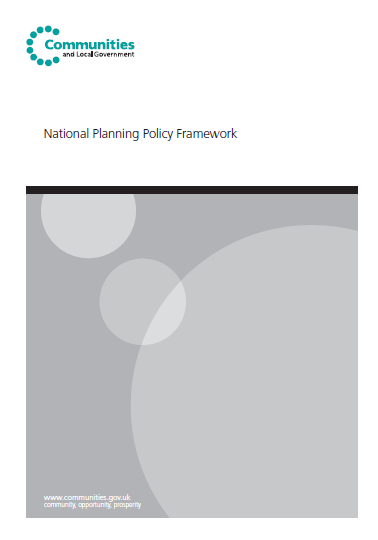 The National Planning Policy Framework formulated by the current Liberal- Conservative coalition government has been published in march 2012. Specific policies in the Framework indicate development should be restricted. 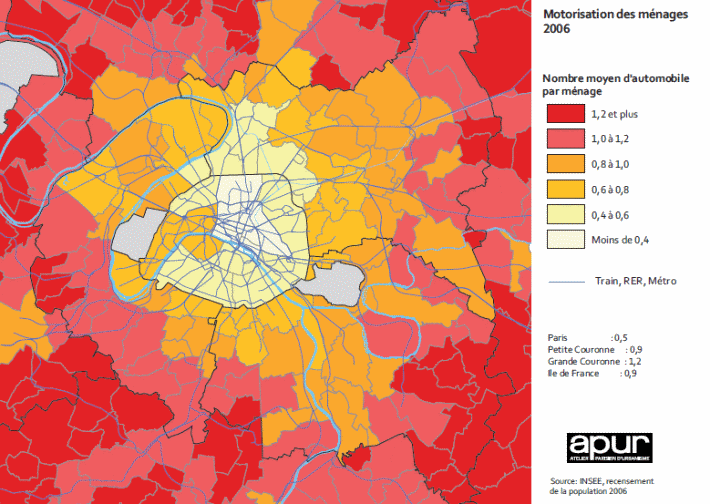 The historical core of Paris is the most complex zone of the metropolitan area. 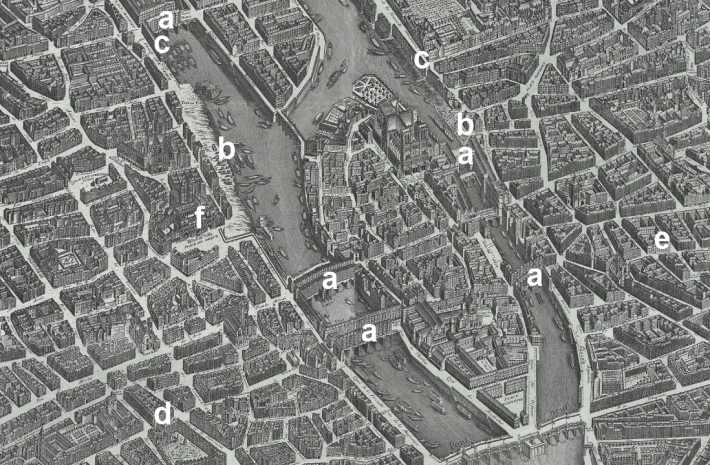 Despite its continuity as the urban core since roman times, the substantial transformation during the XIXth century under Baron Haussmann and the subsequent works during the XXth century make it in many places a somehow recent urban tissue. Under the reign of Napoleon III and for a not that long period (1853-1870), Haussmann directed a radical urban transformation. As well as Cerdá in Barcelona or the English reformers, he associated the old urban tissues from the middle ages to epidemics and social problems, and thought that transforming these areas was an urgent need. c- Demolition of buildings on shores, leaving an open view from the upper streets. His approach to the problem is similar to what can be seen today in many cities: a combination of a search for administrative efficiency that sometimes forgets any other goal, and a new paradigm. If today the paradigm is the idea of sustainable development, Haussman is the first example of what late will gain traction to reach its zenith around the first world war under the name of hygienism. Fueled by new management techniques (which make him suspect of financial scandals), Haussman is not limited to the urban extension problem as Cerdá in Barcelona (whose ideas about refurbishment of the existing city never fully gain traction), as he also defines, with a central role in his urban model, a transformation of the central core by opening many boulevards that ensure a consequent streets grid. The sanitation and sewage system is an innovation in its days, due to its design and ambition, and the Seine shores receive embankments. The romantic image of the XIXth century Paris that is transmitted by tourist guides is an abrupt change for the people that live these transformations. 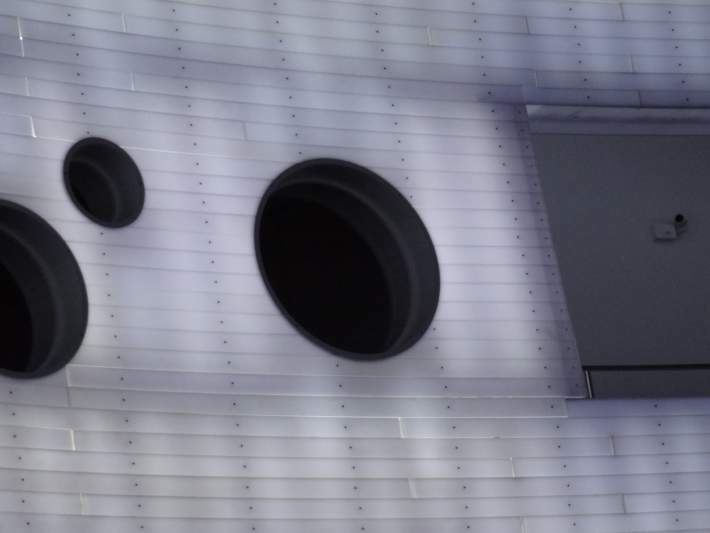 Elements that today have been integrated to the urban landscape and can be seen as unmistakably Parisian by tourists are in the beginning just mass- produced urban furniture fixtures that are placed in an uniform way on the public space. Paris today is still marked by the Sebastopol and Saint Michel Boulevards, what was the large market of Les Halles (substituted by a large retailing mall in the 1970s and a large transit exchange, and nowadays again subject to substantial construction works for a new radical transformation) and the new embankments, plus the building of a large number of monumental scale buildings that are designed to highlight the axis of the new boulevards. The difference between this experience and that of other cities is the high technical and aesthetical quality of the designs of these elements, as well as the inner coherence of the urban project, that would not be completed until after the fall of the second empire. The lack of a geometric basic system allowing for an extension ad infinitum of that new urban tissue, as Cerda’s grid, is not an obstacle to the continuity of the tissue, as that role is played by the Thiers Wall. 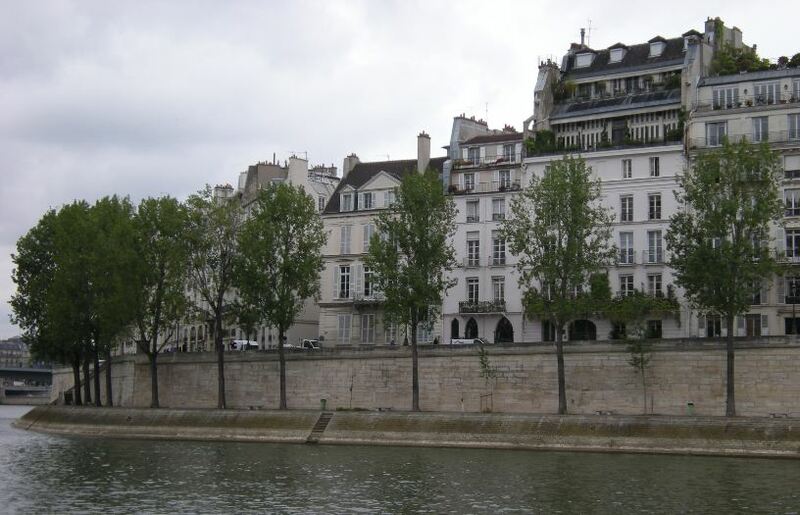 While Barcelona and Madrid tear down their walls in 1860, in 1844 Paris opens a new external wall, in that moment far away from the urban area, but anyway a rigidity condition. 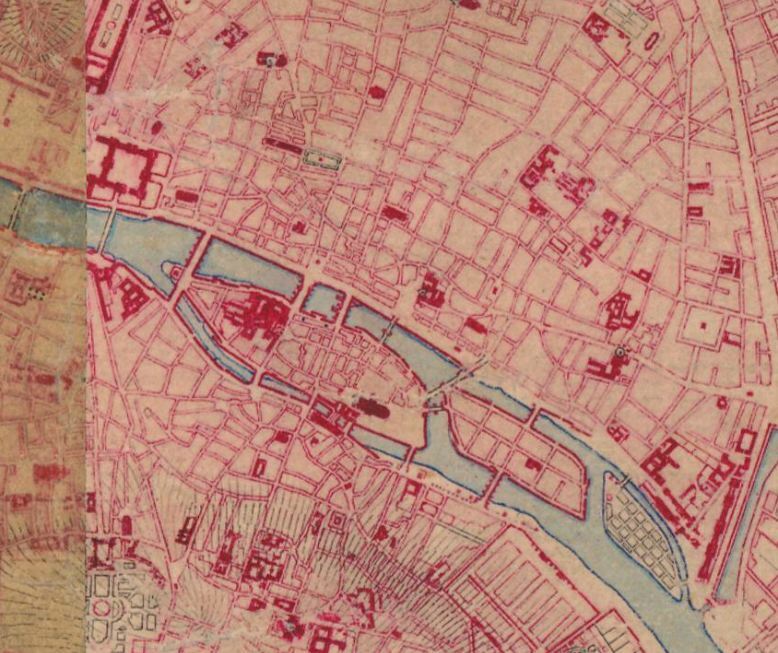 These walls are demolished between 1919 and 1929, and later their vacant site becomes the location of the peripherique beltway, but to this day the 1844 wall marks a discontinuity in the urban fabric and is the administrative limit of Paris. 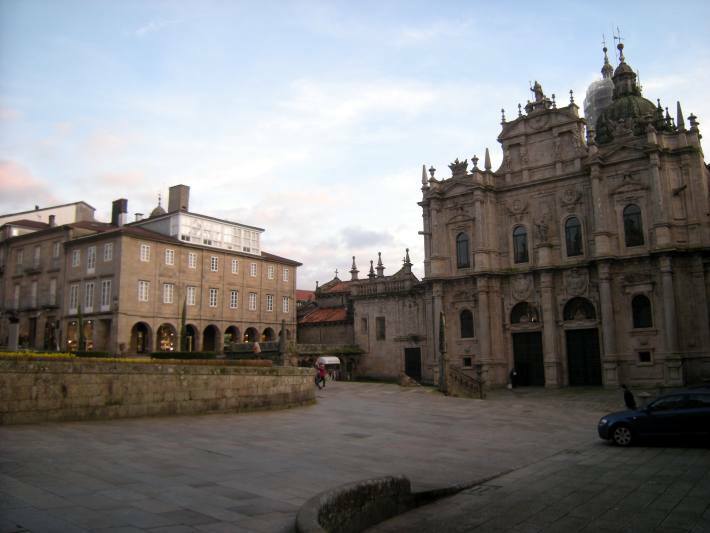 Santiago de Compostela is a municipality (pop 95.000 in 2011) which is the capital of Galicia, the northwestern region of Spain. The burial site of the apostle Saint James is discovered in the IXth century; according to some legends he came to Spain to spread the gospel, but other sources say that his disciples transported his remains from Palestine to Galicia in a boat. The discovery brings pilgrims, and the sanctuary gains political force and urban size. A large part of Spain is occupied by muslims, as well as Jerusalem, and the rise of a relevant shrine in one of the ends of the known land appears as an opportunity to expand the catholic religion. The Cathedral becomes with the time one of the biggest in Europe, although far from the size of Saint Peter in Rome. The firs element is a small chapel. Works for a major temple begin in 1075, and in 1211 a Romanesque cathedral is consecrated, becoming the basis of the present building with some later alterations (mainly the baroque façades). 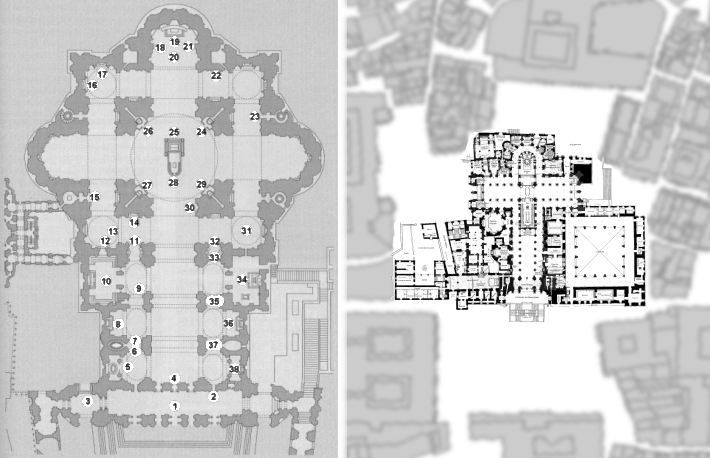 The building sits on a complex ground, with sizeable level changes, and so the Cathedral is surrounded by squares and large stairways. 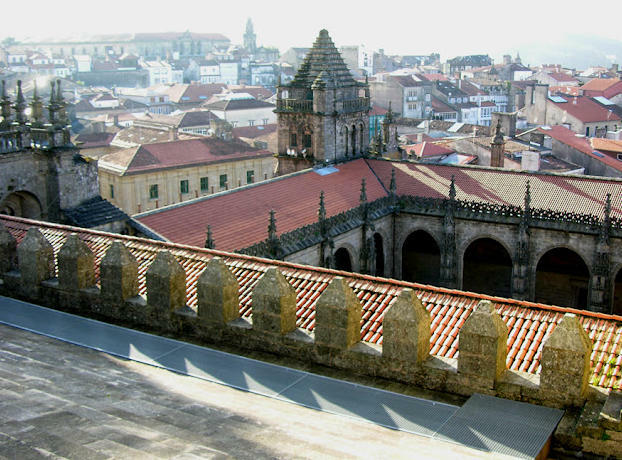 Today it is possible to visit a space that is almost an additional square: the stone roofs of the central building, allowing for good view over the historical center. The Cathedral and most of the buildings in the old city are in granite; the quite rainy climate and the condition of the stone have it often covered in part by moss, and the effect of pollution is also relevant for conservation. 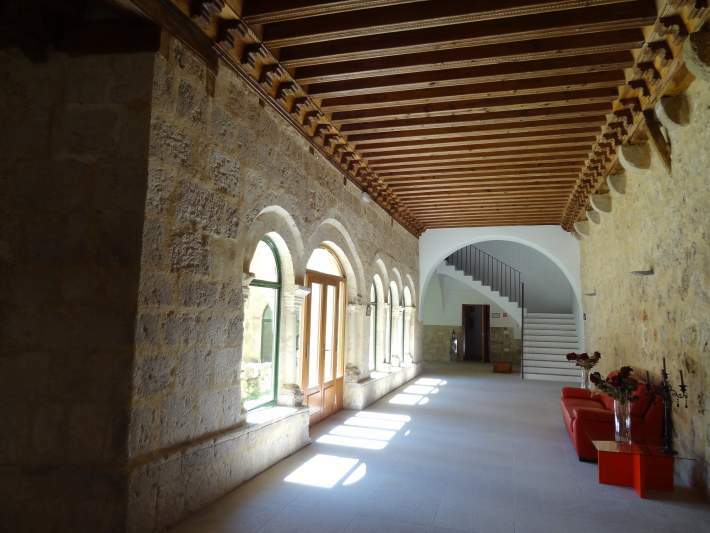 The building is subject to periodical conservation works, and from the 1980s there has been a strong conservation activity in relevant historical buildings and also in more domestic architectures. Pilgrims mean a communication and innovation current during the middle ages, as well as the emergence of a network of churches and inns in the different parts of the Way of Saint James. 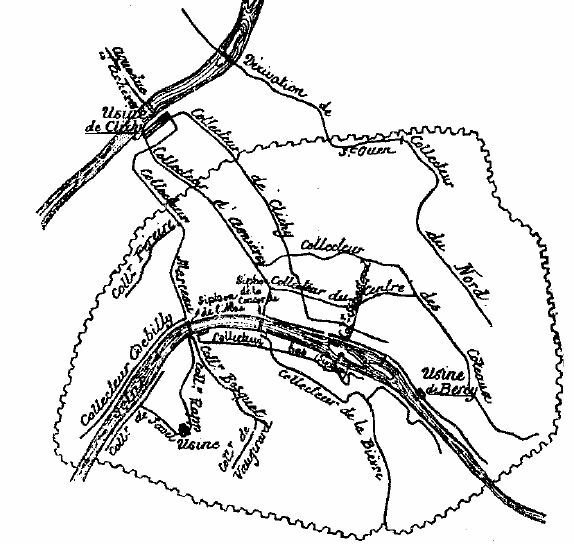 The most relevant section is the French Way, that goes through northern Castille, crosses the Pyrenees at Roncesvalles and has in Paris a relevant node, with ramifications towards other parts of Europe. The Diocese becomes powerful as one of the main actors in the region due to the pilgrim’s gifts, and keeps that power for centuries. 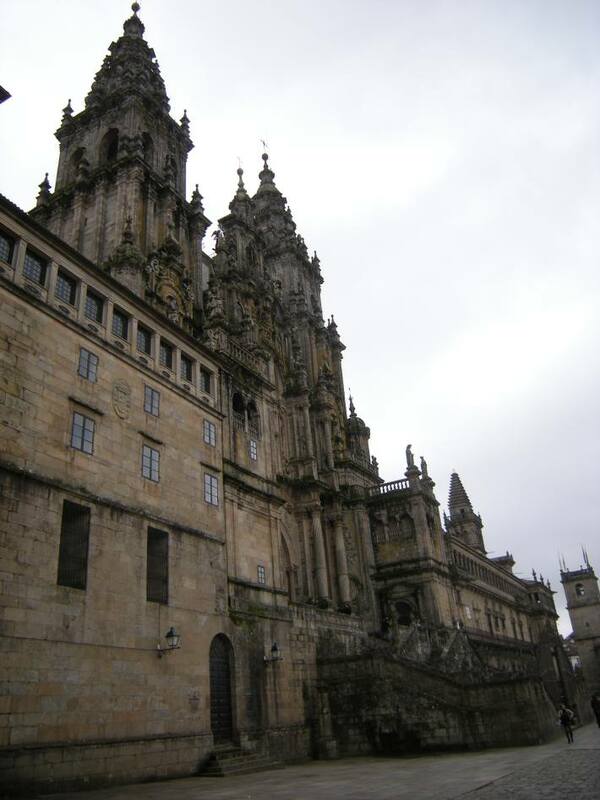 The University is established in 1459, being one of the oldest in the world. 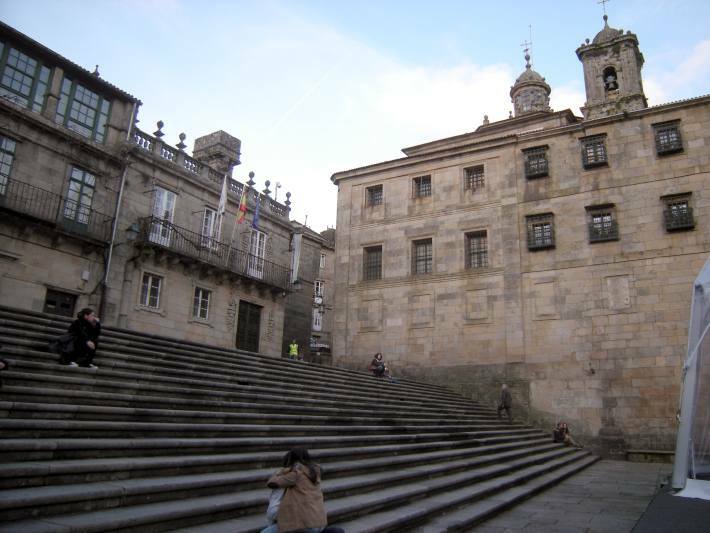 In the XVIth century a part of the political power is transferred to La Coruña, 60 km to the north. 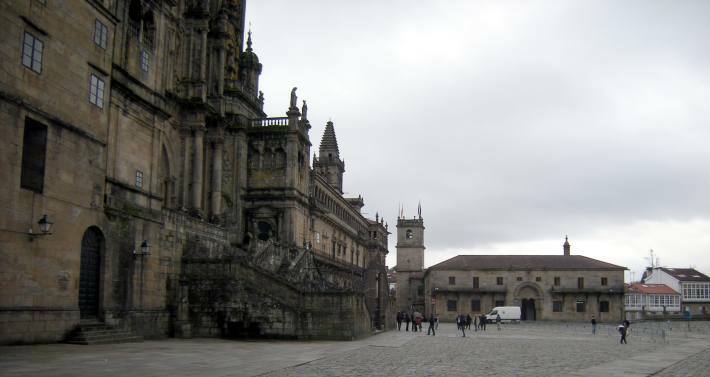 The new quasi-federal regime of today’s Spain means that Santiago becomes the capital of the Galician region in the 1980s, and the old city is inscribed in the World Heritage List in 1985. Tourism is one of the main sources of revenue in the city, along with its function as regional capital and the University. A part of the tourists still come by the Way of Saint James, be it walking, biking or astride their horses, meaning a low carbon tourism (despite the fact that their trips back home are often in motorized modes). The municipality has less than 10% of the provincial population, but its touristical index (a synthetic indicator calculated by the Anuario Económico de España 2011) shows it concentrates 38% of its tourism activity. There is a wide array of prices and qualities, from the Hostal de los Reyes Católicos as the most emblematic hotel to low cost youth hostels. Tourist arrivals multiply on holy years (those in which the festivity of Saint James is on Sunday). What is the use for an automobile? This seemingly simple question, whose answer seems evident, lies at the base of a relevant part of the debate on urban planning in many countries, even if it is almost never asked in those terms. We own a car, used essentially for out of city travel; I am lucky to live near the center of Madrid, at just half an hour’s walk from my job, so I walk nearly all days. It’s faster and way cheaper than to use a car or even public transit (which is common for such short distances). Sometimes we use our car to go to peripheral big box retailers, but most of our food is bought in the neighborhood, and for more specialized items we usually at least browse the central Madrid stores, a convenient collateral of working in the area. Sometimes I use my car to get to working meetings in places in which there is no convenient public transportation link, but I usually prefer to take a train or a bus, because travel time is better and I can work during the journey, something quite useful to manage my working time. But not everyone does things as I do. The car is quite used in metropolitan Madrid. A sprawling growth pattern for housing and jobs contributes to that. Even if the classical planning theory says that there should be a balance between jobs and working age population in all municipalities, this goal is hard to attain when contracts are not kept for long times, a growing issue these days. Besides, shopping systematically in big box peripheral retail centers also increases the car traffic. On the other side, a sizeable group of citizens prefers their cars to public transit to avoid lengthy transfer times, or simply to avoid “smelling the sweat” of other travelers. 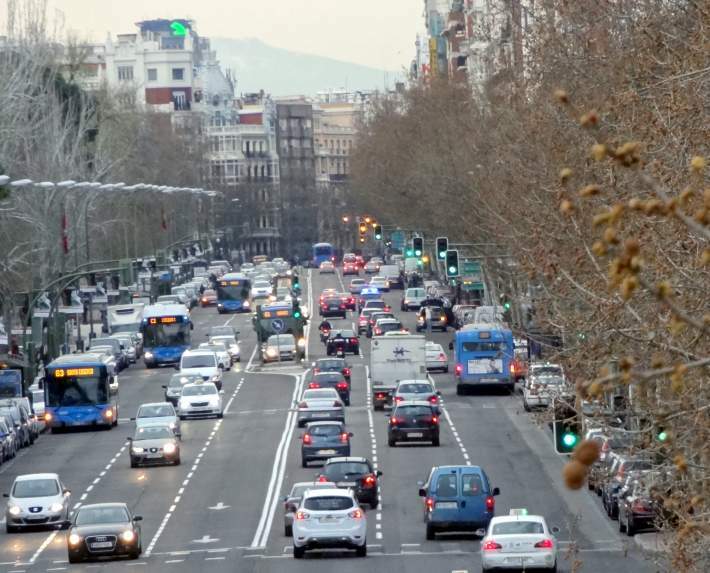 Madrid municipal statistics show that in 2010 there were 2.541.000 vehicles on the street on an average day (a bit more in june, but 25% less in august). Most of this traffic (nearly 20%) concentrates between the M30/Calle 30 Beltway and the inner avenues subject to traffic lights. The average speed is on the whole 24,16 km/h (less than half in the older part of the city, up to 67 km/h on beltways). 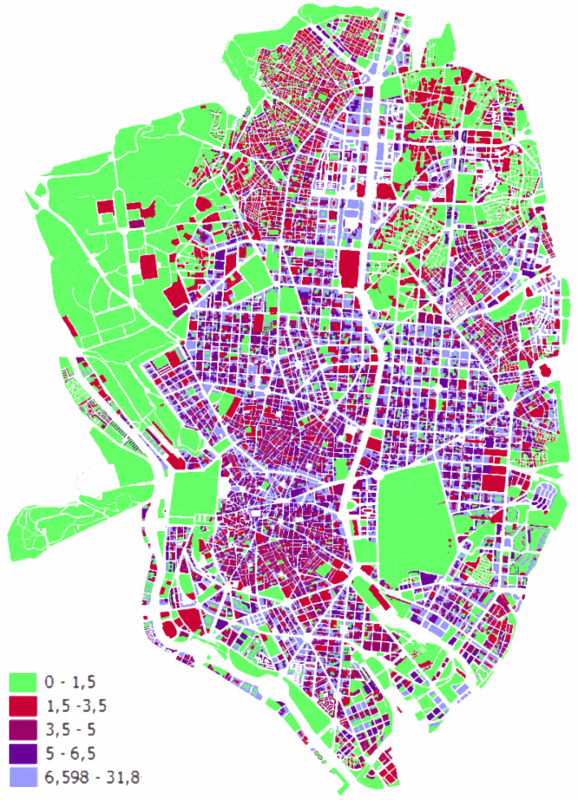 Vehicles paying local taxes in 2010 were some 1.740.000 in Madrid (some 2 citizens per car), 78% of which were cars. 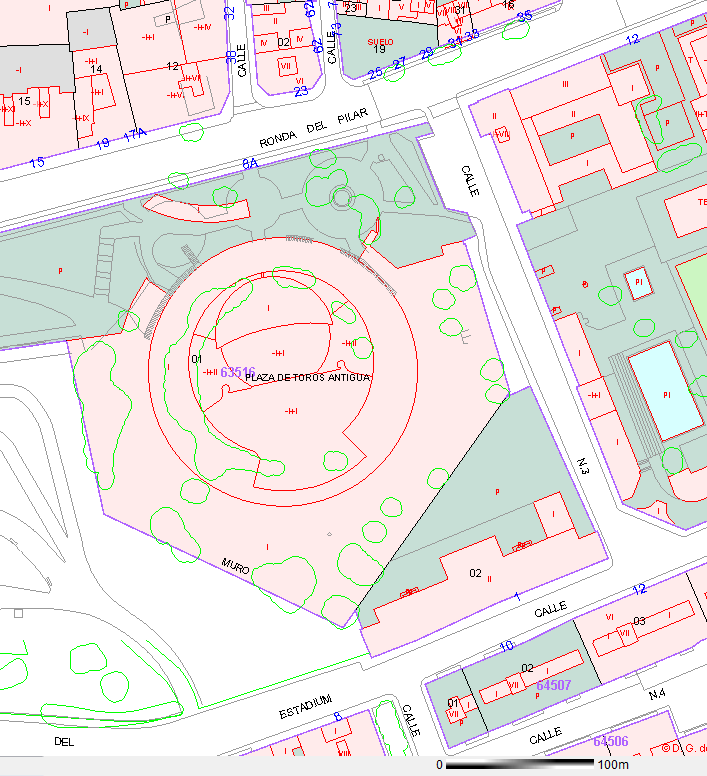 Using cadastral data there are 0,93 cars per housing unit as a municipal average, with lesser values in the scope of the Proyecto Madrid Centro, while in 2005 New York (but for central Manhattan) had 0,59 cars per dwelling, and París’s 2006 figure was 0,47. 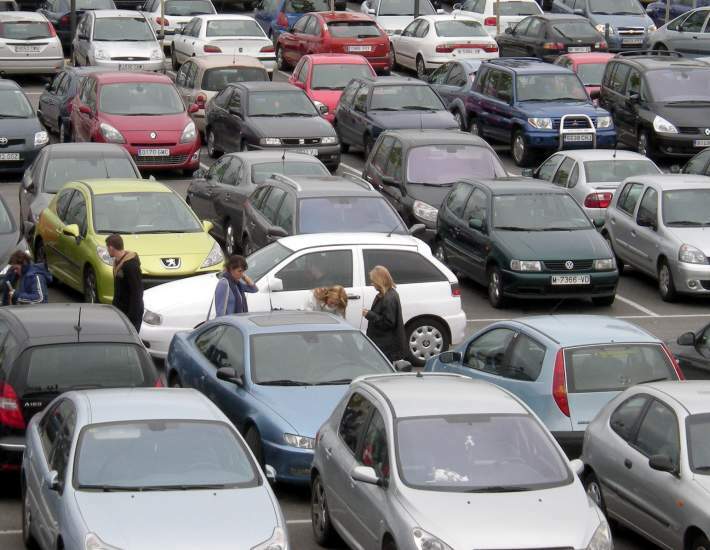 During that year 865.000 cars used public parking. In the streets subject to park meters the average parking spot was used by two cars a day, each staying less than an hour. 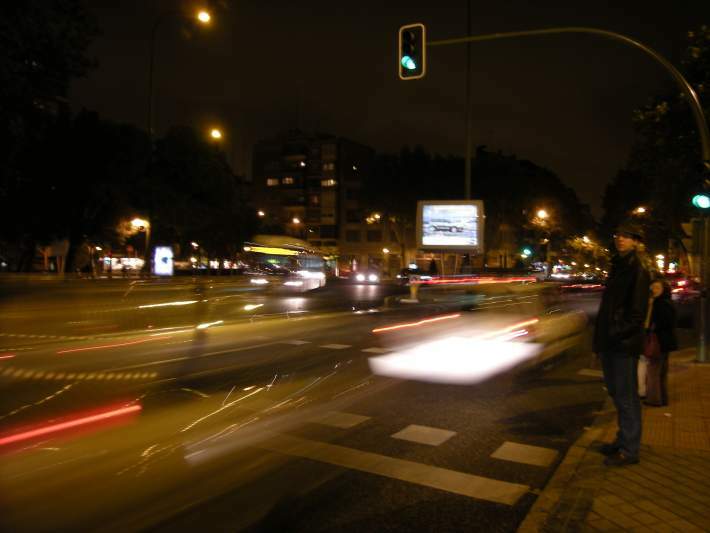 In 2010 road accidents killed 34 and injured 11.744 in Madrid. Also in 2010, municipal buses moved 439 million people, and the subway moved 632 million. Long and mid distance train stations were used by 21 million, and 300 million metropolitan train stations (nearly half used Atocha station). Some 50 million used Barajas Airport. The relation with the car varies from country to country, but essential issues defining it include urban pattern, availability of alternative transportation, available income and normative framework. Cities in emerging countries as Mumbai have car ownership rates much lower than in Europe or North America, but they are growing; and even with such low car ownership rates vehicles can be a nuisance, as the citizen group Casablaklaxoon shows in Casablanca (Morocco). 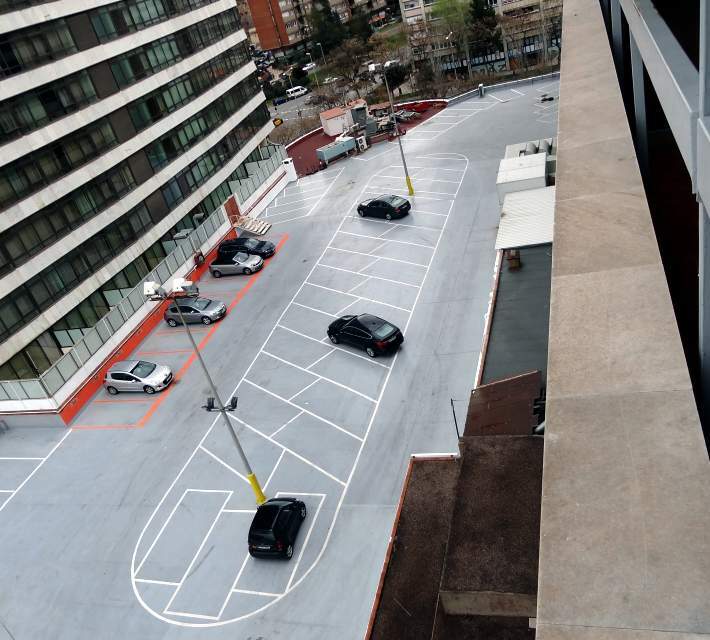 The requirement for parking inside buildings is still enforced in central Madrid, while in central Manhattan there is a less straining specific rule since 1982. How do you use your car? Badajoz is a city (pop. 151.565 in 2011) on the Spanish-Portuguese border. 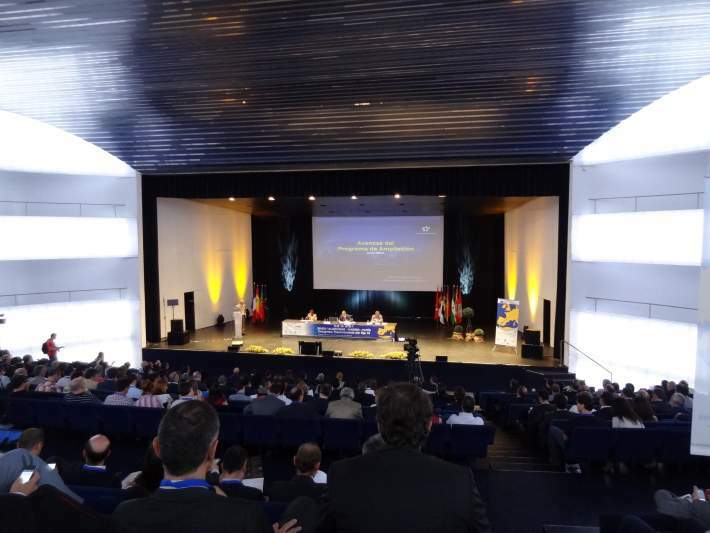 Some days ago I went there to a congress on an European transportation project, Axis 16, whose investment priority has been reduce, leading to protestations from the concerned regions. Axis 16 would configure a high capacity freight rail link between the Portuguese port of Sines and the French rail system through a new tunnel under the central Pyrenees mountain range. 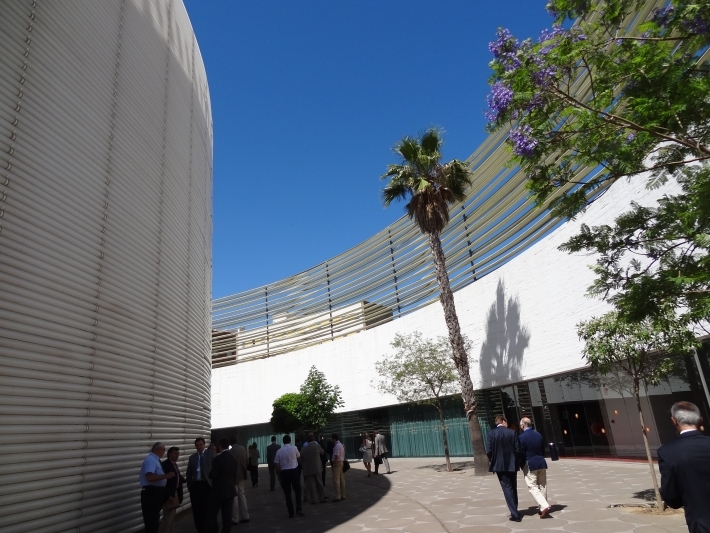 Beyond the interest of the Axis 16 project (which implies a substantial refurbishment for an existing infrastructure currently obsolete, and therefore a reduced environmental impact), one of the surprises in this travel was the venue: the Badajoz Congress Palace. Here the tourist space is not related to holidays but to business. The convention tourism is a specific dimension, implying a chance to get substantial revenue and to show the city to clients that can later come back for leisure. 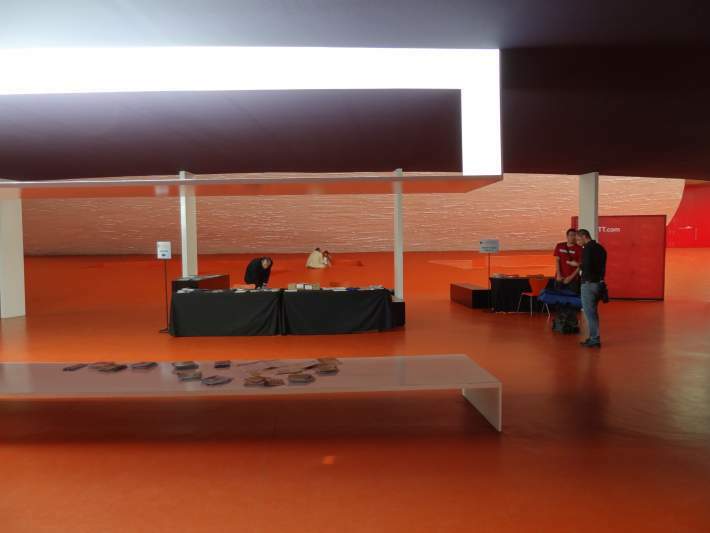 Most of the sizeable cities in Spain have specific convention venues, but organization abilities are at least as relevant as the built infrastructure. In this case organization was reasonably good, and 60 euros gave right to the convention and good quality food for the two days. 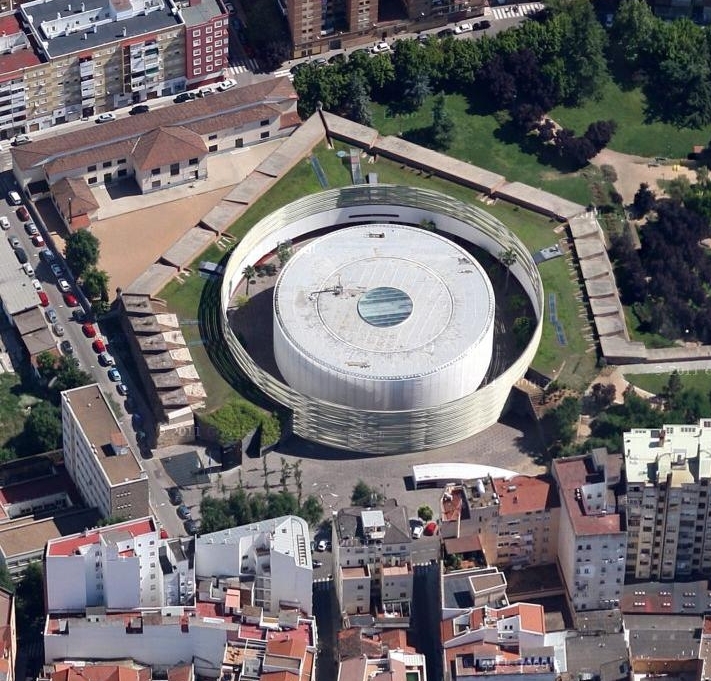 On a XVIIth century bulwark, occupying the site of the former bullfighting ring, the building constitutes a volume with a clear presence, but despite its size and visibility there is a hermetic dimension due to the access configuration. 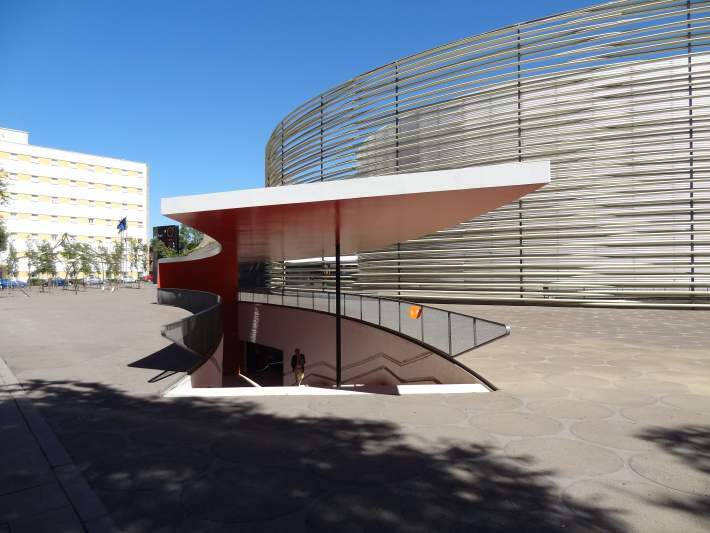 You enter the building through a descending staircase covered by a strong orange color element, that is out ouf the cylinder defined by an open structure similar to a large basket. From there you enter a foyer in which the orange color and natural overhead lighting are the main element. The congress hall is marked by translucent wall which are back-lit. The volume of the hall is separated by a courtyard defined by both cylinders from the smaller reunion spaces. The building plays with transparency to variable degree. 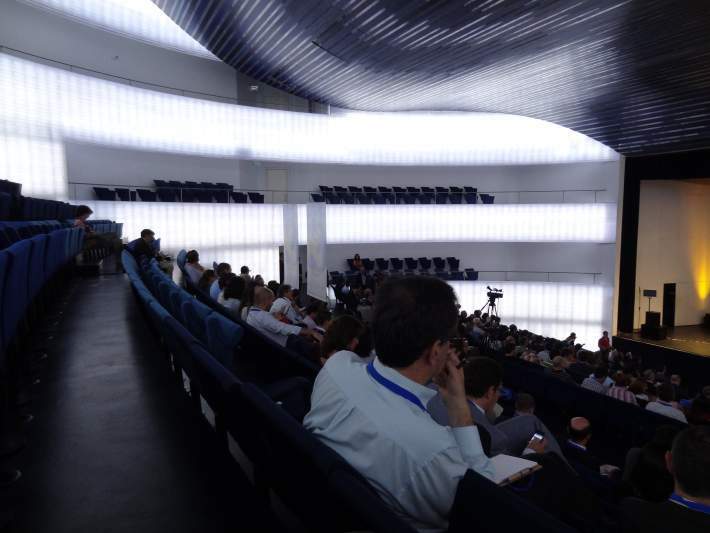 The result is interesting, even if a question could be raised by the energy used by the back-lit walls in the congress hall. The emergency exits and the disabled access routes are out of sight, but they are surely as simple as the rest. The access route in a descent to later rise to the congress hall creates a spatially rich itinerary but is not tiresome. Some materials are not as well finished as they could, but the whole is spatially quite satisfactory. The circulation spaces and the halls can seem large in the photographs, but in your average congress they are soon filled. The lot has an area of 14.291 sq m, with a floor area of 10.453 sq m.
As summer approaches, it is a good moment to begin a series about tourism and its meaning in terms of architecture, urban and regional planning. Tourism is one of the main economic engines of Spain (nearly 10% of GDP in 2011, and close to 12,5% in jobs), and it contributes to balance external payments. In 2010 Spain was the fourth country in the world in number of foreign visitors (after France, the USA and China), and the second in dollars spent per tourist and day (996) after the USA. With a population over 46 millions, the country received in 2011 nearly 57 millions of international tourists, and the number of internal tourists was also noticeable. This situation is by no means an accident, but the result of a state policy started in the 1950s as a part of a broader plan to revive the national economy after the 1936-1939 civil war and a long international isolation period during the 1940s. tourism had an effect on economy, but its influence was also felt strongly on landscapes and territories. This state policy rested on a preexisting tourism sector that was hardly developed, and reinforced it with strong expenditures in advertisement in foreign countries that was successful in a moment in which tourism became popular, European families began a long high spending period and enjoyed an increase in mobility due to cars and planes. Beaches where the main object of advertisement and of desire for many Europeans, and the Mediterranean coast was subject to an intense transformation, as well in urban terms as in terms of economic or political weight in the national scene, a clear symptom of the force of tourism. With time, tourism has also grown more complex as an economic branch. The sun and beach tourism has been joined by urban tourism, and rural tourism has become during the last decade the fastest growing segment, even if it is still as small part of the total. This first log corresponds to rural tourism. 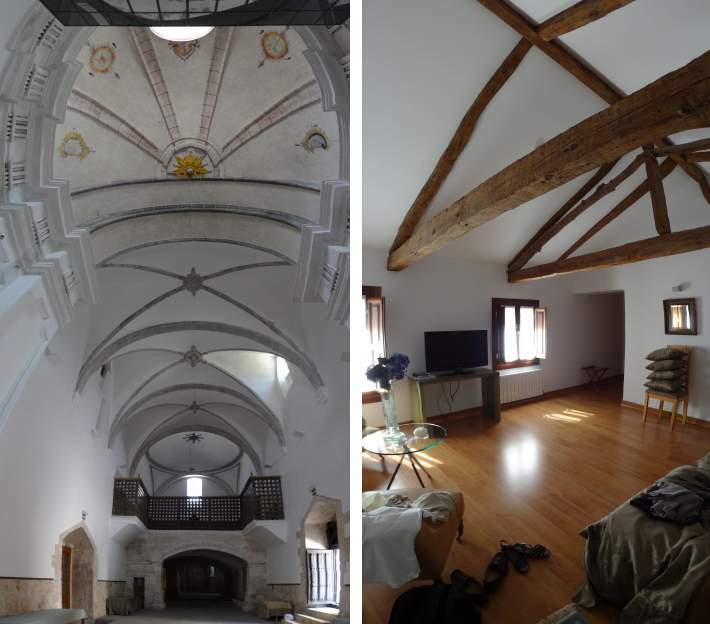 Last weekend we visited the Posada Real- Monasterio, a hotel in the municipality of Tórtoles de Esgueva (province of Burgos). 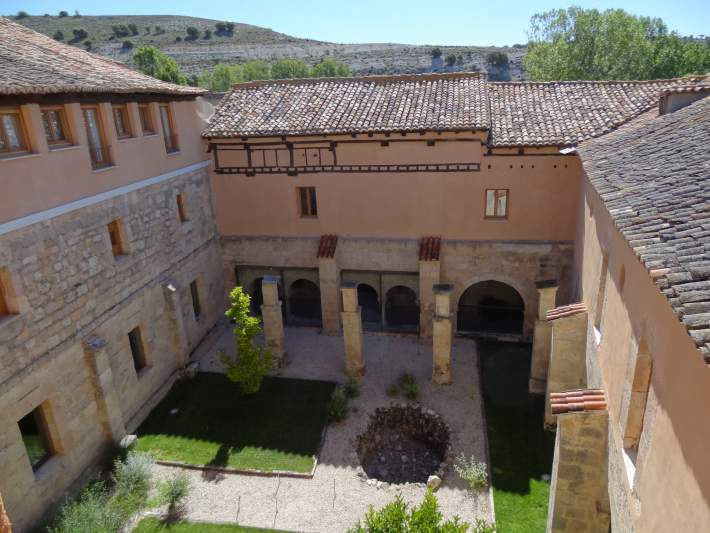 The firm was constituted some five years ago with an aim to exploit a hotel in parts of an ancient enclosed monastery. The building is near a small hamlet (population 501 in 2011) which suffers the regressive demographics so common in inner Spain. Despite that, the statistics of the municipality are somehow improved (41 under 16 years in 2011) and the presence of foreign migrants can be felt, as in many areas during the last decade, with 98 foreigners in 2011, mainly Romanians and Moroccans. 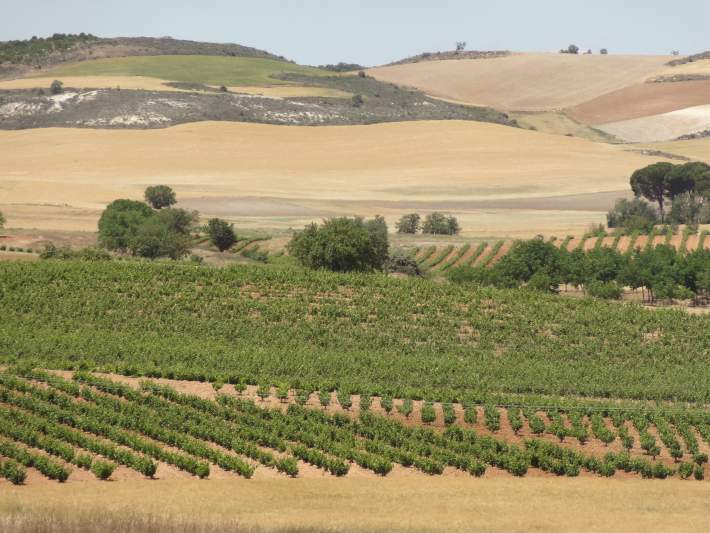 One of the main reasons to locate the hotel in that municipality is its inclusion in one of the most dynamic wine growing areas of the country in the last years: Ribera del Duero, an area that gravitates around Aranda de Duero, a city on the A1 freeway, which links Madrid to Paris and Northern Europe. A quality policy joined by a Designation of Origin have contributed to good sales, but also to promote the cultivation land in tourism terms. This association of quality production and cultural and rural tourism shows the innovations in the tourism sector, and is also one of the claims of the plans and policies concerning these inner regions often threatened by depopulation. The visited hotel follows these patterns: it creates local employment not subject to the cultivation times, generates tax revenues for the municipality and contributes to the image of the area. With a quality hotel offer and a price range on par with similar hotels, it focuses promotion on the building itself and a combined high quality food and wine offer. 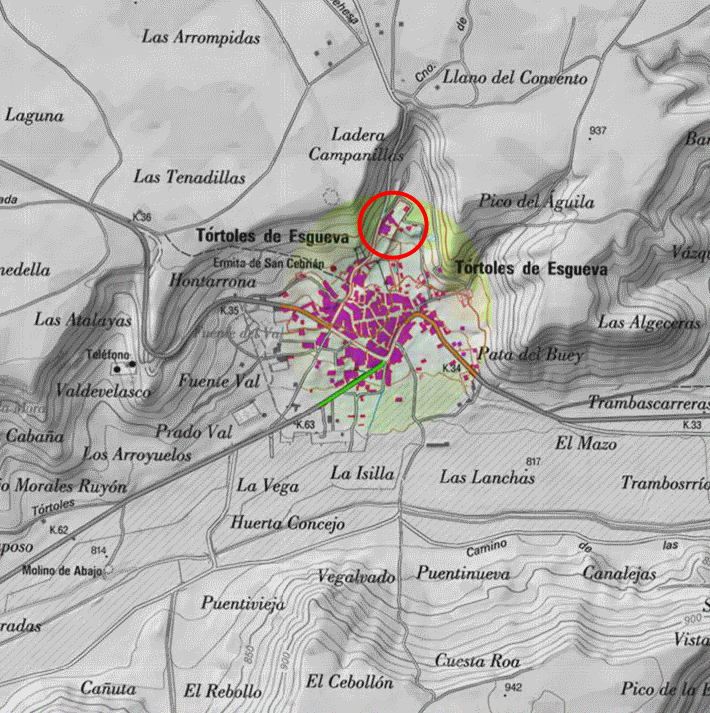 The hamlet of Tórtoles is on the slope road linking the Esgueva Valle to the upper plateau; the Posada (Inn) is on the upper area, towards the plateau. It shares the building of the old monastery with other uses, a fact that makes it difficult to see it from the road. The architectural qualities of the Inn include two chapels and a chapter hall of interest, surrounded by a cloister and the old residential structure of the Covent, with more domestic qualities, but of interest. The original structure is maintained, and the architectural integration of such new elements as the elevator is satisfying. The food and hotel offer is interesting and shows high quality, as the personalized attention to clients. 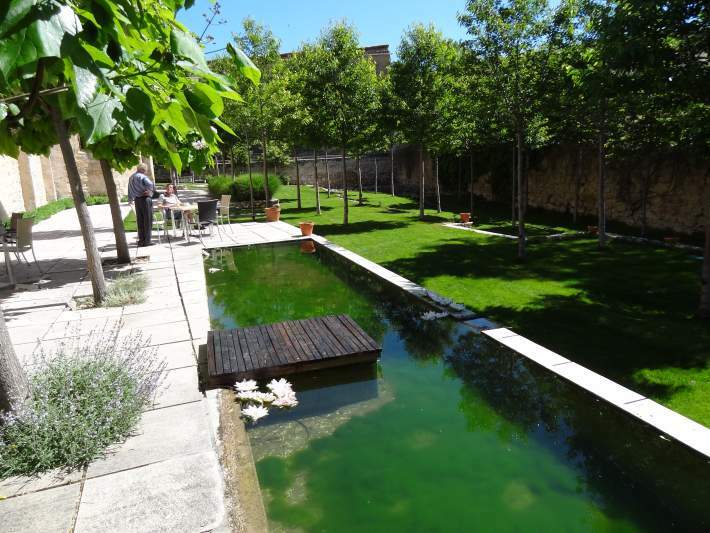 The clients are tourists visiting the Ribera del Duero and its wine-tasting routes, urbanites from Madrid or other cities that come for a weekend out of the city, and marriages and all sorts of social events. The contraction of the Spanish demand can harm the midterm results of the business, as in many parts of the country; this would also influence the sustainability of the small rural hamlets network. 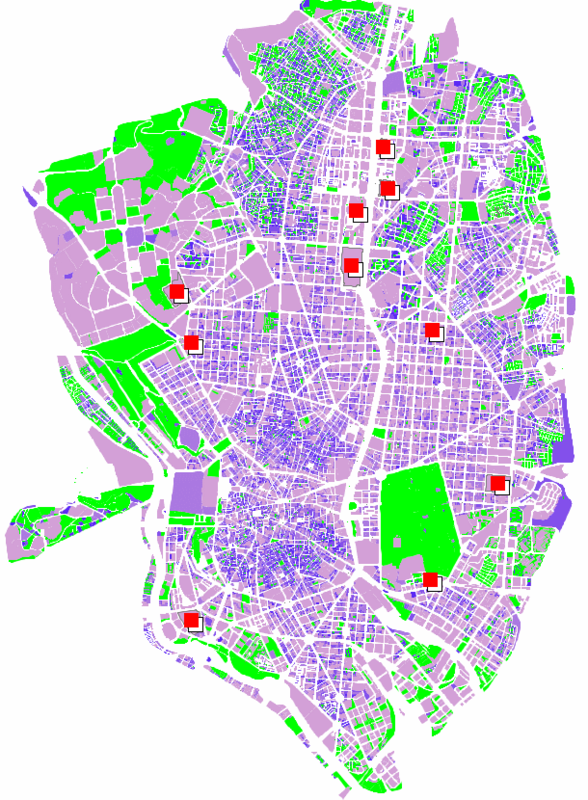 Madrid has a dense public transportation network. An essential element is the metro (rapid transit) network, opened in 1919 and counting today 12 lines, 296 km of track and 238 stations. The network is managed by the Regional Government, and is integrated in a Regional Transportation Consortium that has a unified fare system. In 2010 metro sold 630 million tickets, the highest figure among the elements of the transportation system. 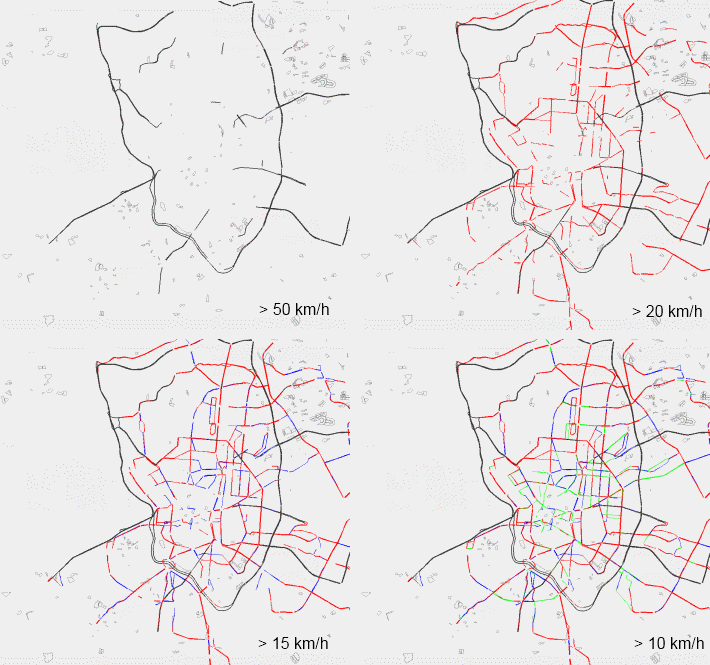 As in most rapid transit systems, it is focused on core- periphery relations; the network extensions have reinforced the nodal role of the historical city core through the links among confluent lines. 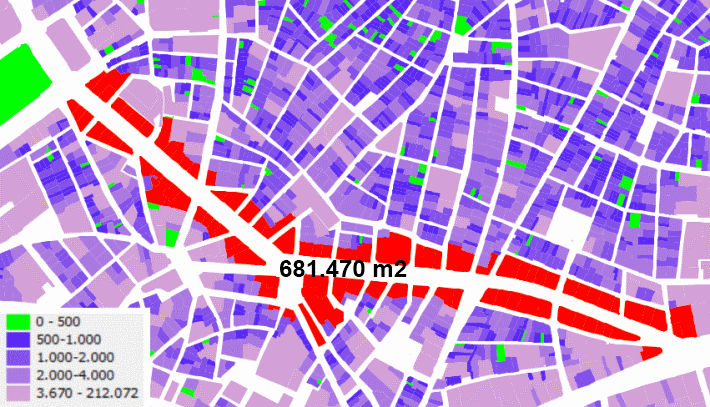 Not having a fixed limit for the core center, and taking as a reference the limit of the scope of the Proyecto Madrid Centro, 48% of that area is at less than 300 m of a metro station. 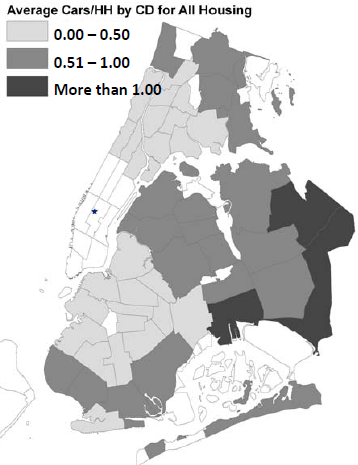 That figure is similaire to that in Paris; Manhattan seems to present a similar figure. 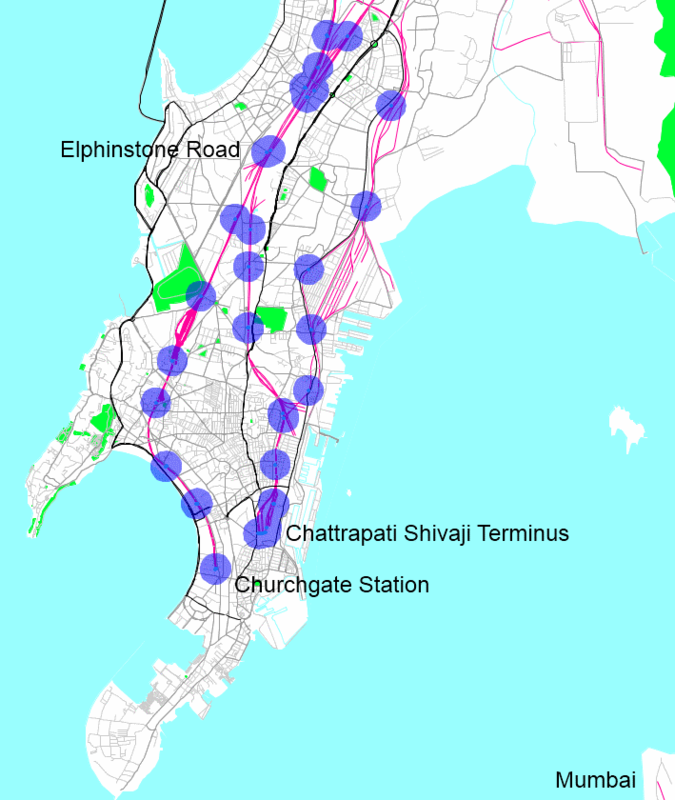 Mumbai, a city that plans to introduce a rapid transit system in the next years, uses the rail network as the backbone of its public transportation system, with a less dense coverage. 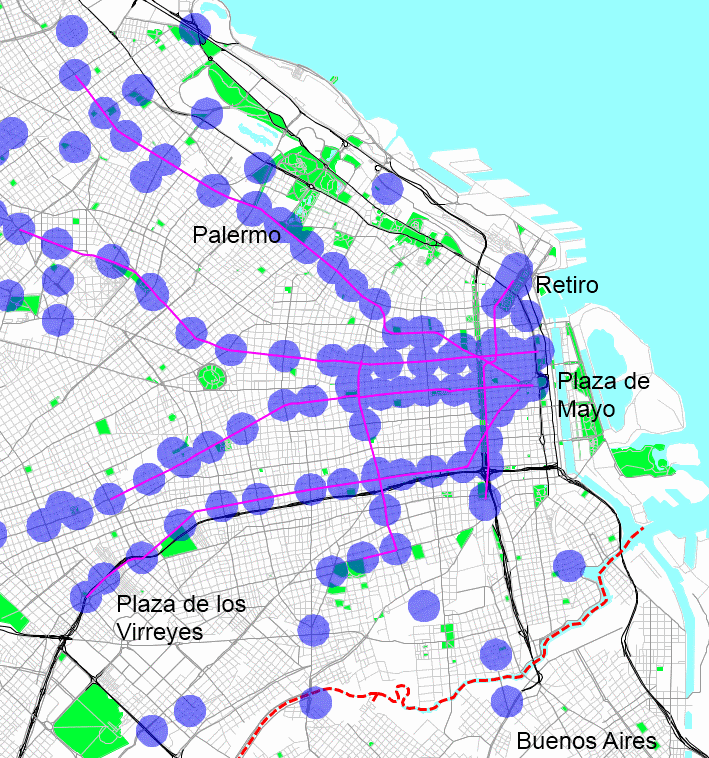 Buenos Aires combines a low density rapid transit network with the railroads. 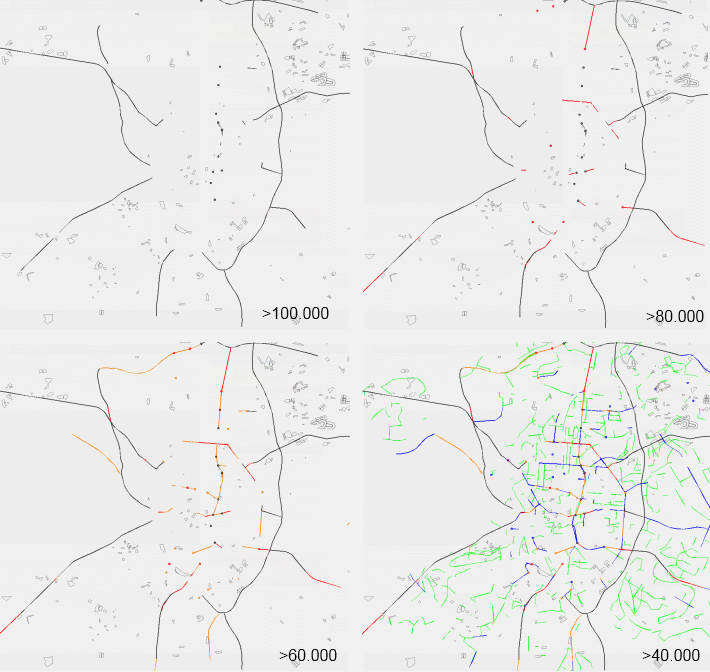 The following maps show the described networks of those cities at the same scale, as well as the 300 m radius from the stations. The network finds its best efficiency through its exchanges with other public and private transportations modes. The city is served by several high speed and conventional rail lines, long distance buses and the Barajas airport; the metropolitan scale transportation rests on the suburban rail network, along conventional rail tracks, and some recent extensions of the metro network. Line 12 (also known as Metrosur) (A) is noteworthy among these extensions. It is a circle line linking the southern metropolitan municipalities (historically those less favored in economical terms). It is linked to the rest of the network through the suburban trains and a single connection to a metro line. Three tram lines have been added recently to the network. 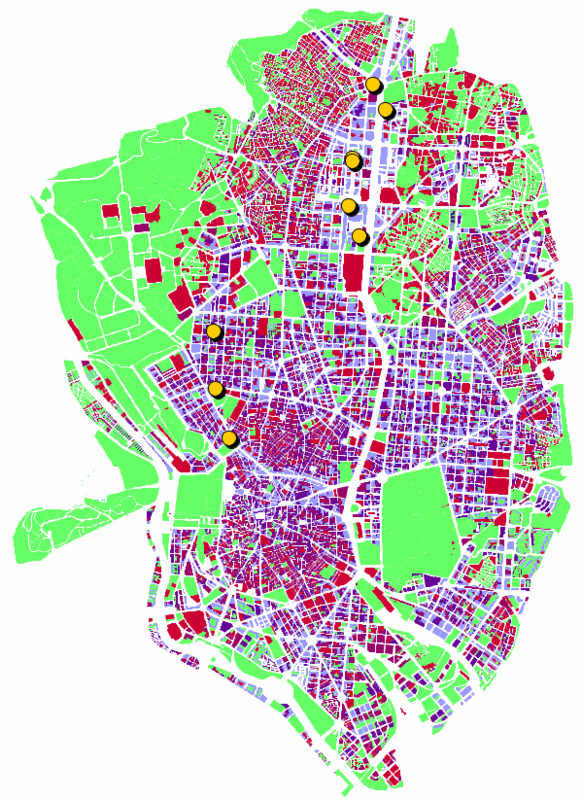 One covers the new residential developments on the northern part of the Madrid municipality (B), and the two others cover the low density developments to the southwest (C,D); a still reduced occupation rate at the northern housing areas and low densities on the southwest make for a complex economic management. 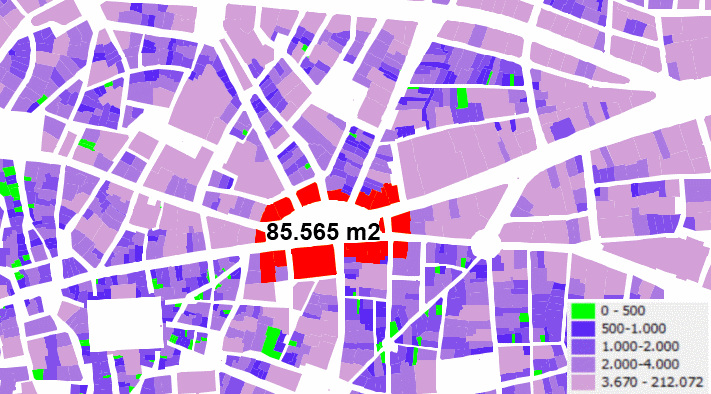 These are some numbers related to the density of the urban core of Madrid, based on gross floor areas as tabulated in the land registry in 2010. 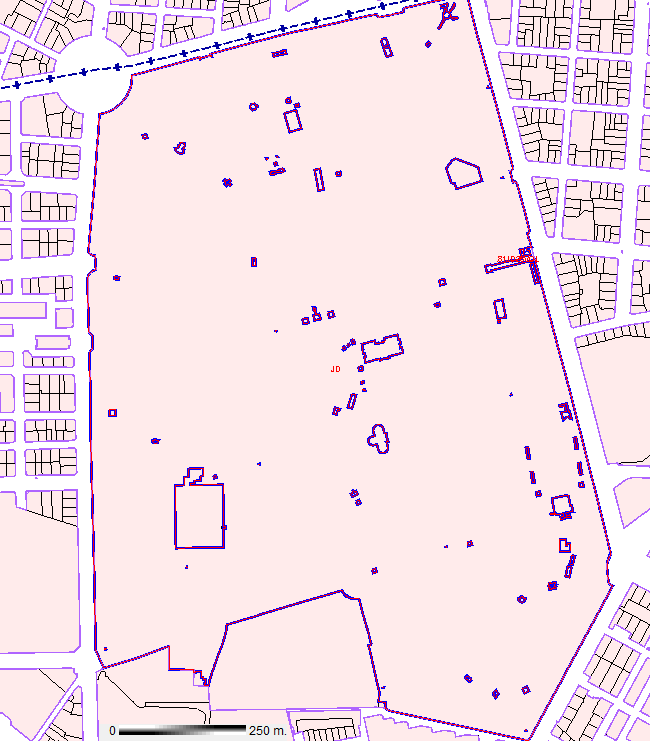 The area covered is the scope of the Proyecto Madrid Centro, including 36.833 lots with an agregated area of 33,829 millions sq m and an agregated gross floor area of 101,434 million sq meters; the average floor-area ratio is 2,99. 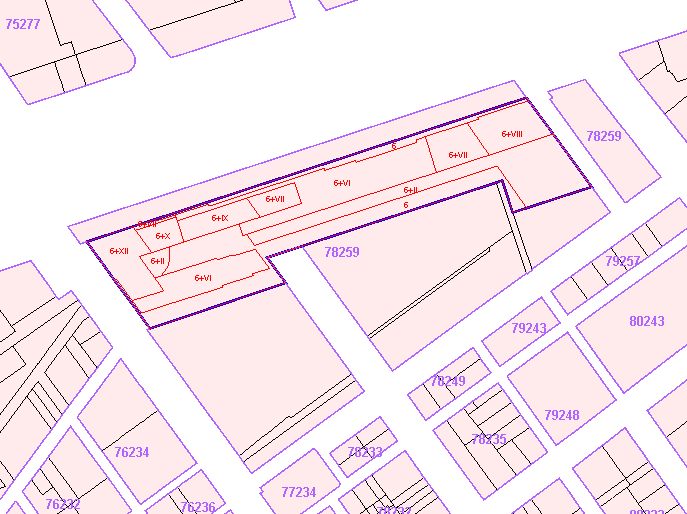 This map shows the location of the 10 lots with the highest gross floor area; for those knowing Madrid, they are sometimes conventional buildings, but they are located on very large fiscal lots. 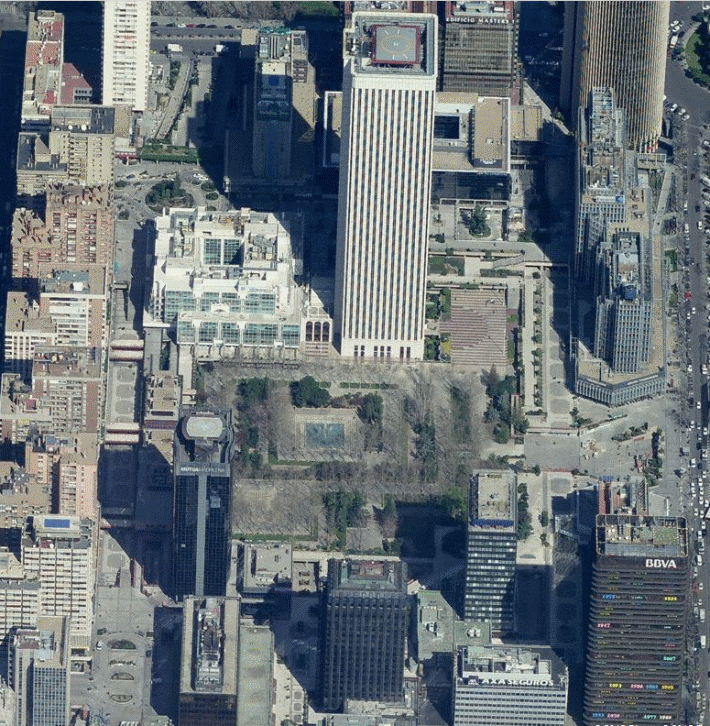 Added gross floor area of the lots adjoining the Gran Vía, a large avenue (1.300 m long) open through the central core at the begining of the 20th century. 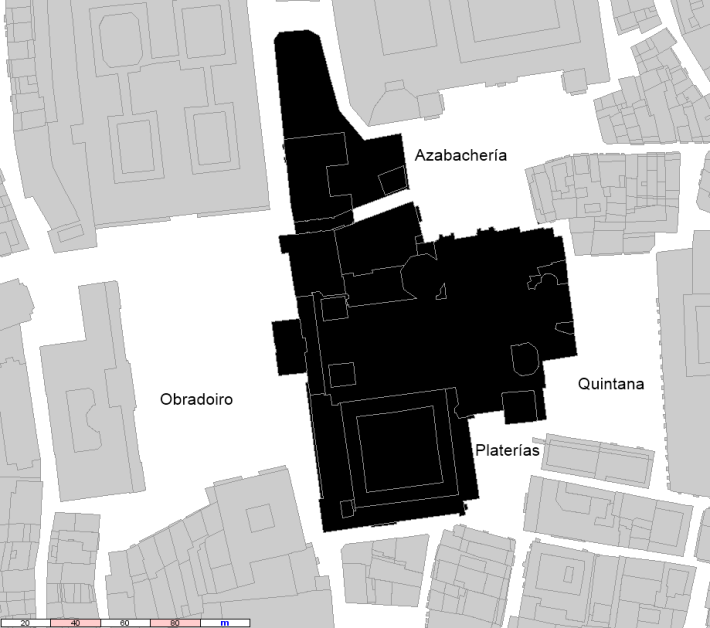 Added gross floor area of the lots adjoining the Puerta del Sol square (225 m on its long axis), the central point of the urban core. 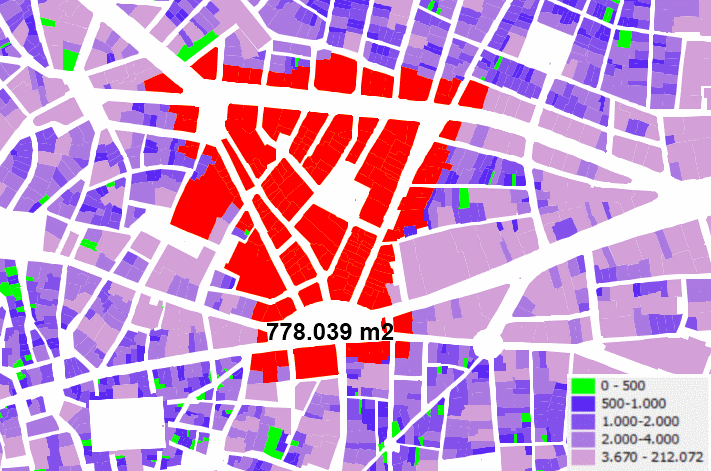 Added gross floor area of the lots adjoining the retailing core of Madrid (the commercial streets linking the Puerta del Sol to the Gran Vía), an area with a combined land area of some 150.000 sq m.
Added gross floor area of the lots included in Azca, the northern business district on the Castellana Avenue (the number is set to grow due to the reconstruction of an arsoned office tower), an area with a combined land area of some 190.000 sq m..
Floor-area ratio in Azca is not substantially higher than in the retailing core of the city, but a different architecture and management scheme has produced a completely different tissue. Explaining an architectural or urban proposal requires transmitting its aims and the context in which they will be deployed. To that end it is common to use a set of numbers than, in the end, are aimed to compare. It is common to state that a building has a surface of x sq ft, or a new neighborhood will occupy x acres, or even that it will have a certain number of dwellings. These figures have a sense only if they can be compared to other known magnitudes, but this part is often omitted, specifically in technical articles. In this time in which numbers have a great relevance and their management must take into account their real meaning, it seems relevant to talk millions. 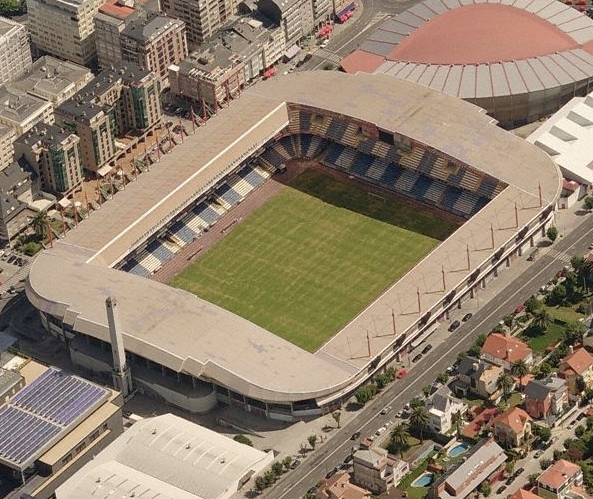 A million square meters (10,763 million sq ft) are 100 hectares, and the Spanish press often equates that to a 100 soccer fields; it is also common to see references to sports fields in other countries. But the size of a soccer field can go from 45×90 m (less than half an hectare) to 120×90 m (1,08 hectare). This surface encloses the turf area, not taking into account the athletics racetrack around it common in many stadiums, or the stands. 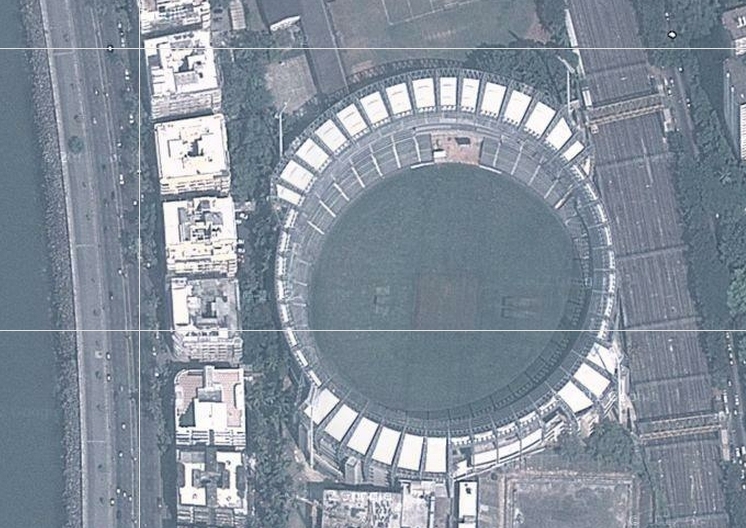 A mid-sized stadium can be easily over 3 hectares, and the ancillary parking spaces can add large dimensions. 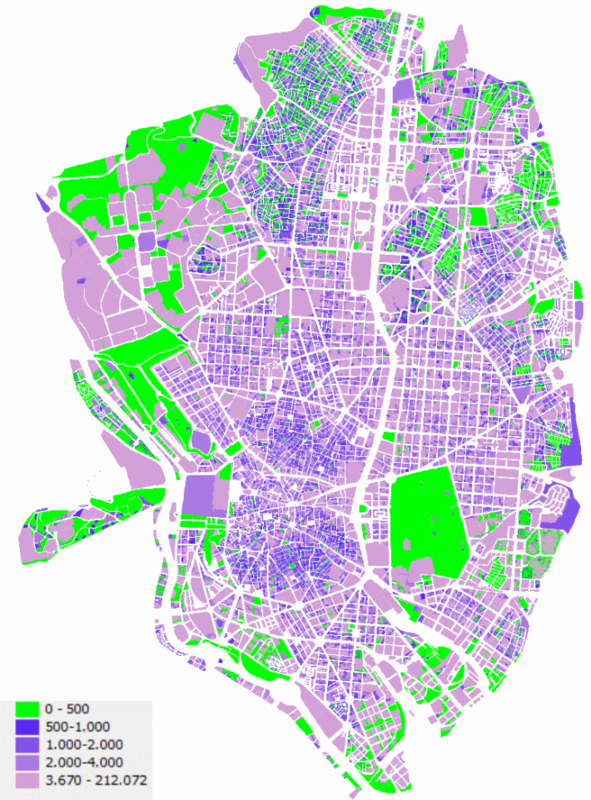 Madrid’s Retiro Park is slightly over 1 million sq m (1.092.395 sq m without the built up areas), which is almost a third of New York’s Central Park (3.399.322 sq m, including the 56 buildings) (in both cases land registry data). In both cases the perception of the dimension of these spaces is related to the landscape design of the parks, and to the visibility of the buildings around the park. 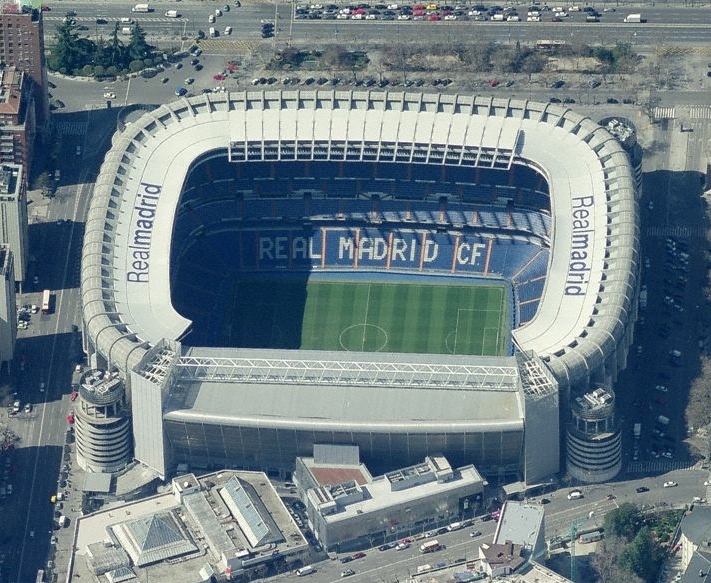 The Santiago Bernabeu stadium in Madrid occupies a 43.688 sq m lot, in which the gross floor area (including annex retail elements) is 114.105 sq m. The Riazor Stadium at La Coruña occupies a 42.828 sq m lot, with a gross floor area of 40.499 sq m (in both cases, land registry data). The Alberto J. Armando stadium in Buenos Aires (also known as La Bombonera) occupies a lot of some 23.000 sq m.
Large stadiums for other sports also have different space requirements. 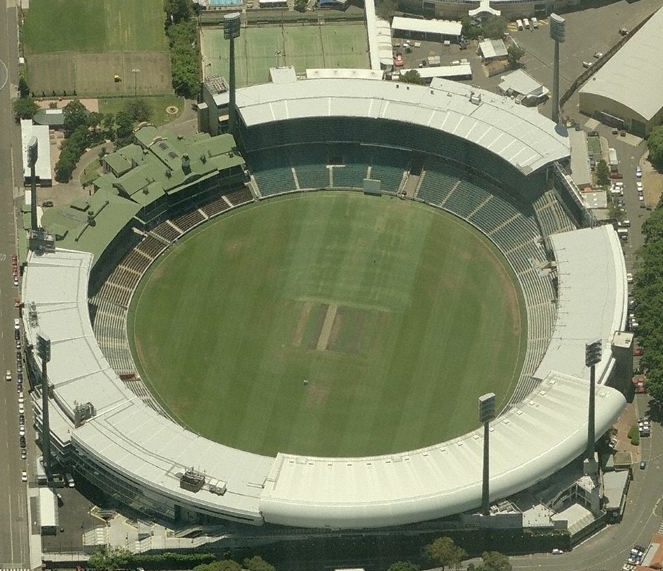 The Sydney Cricket Ground occupies some 50.000 sq m, while Mumbai’s Wankhede Stadium is in the 31.000 sq m category. 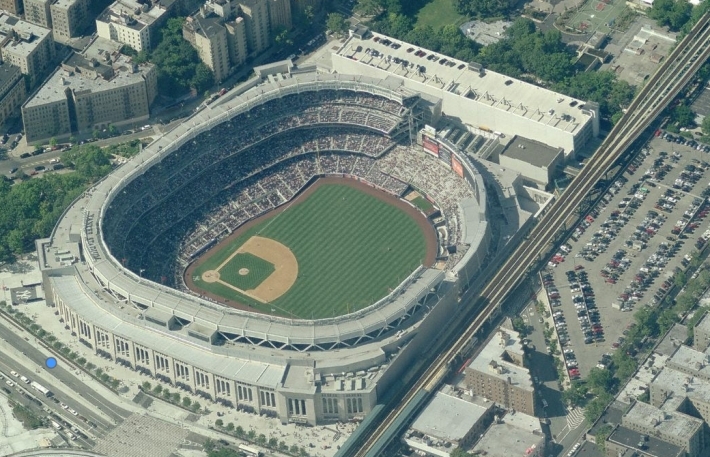 The new (2009) Yankee Stadium in New York is in a 314.000 sq m lot, with a gross floor area of 261.312 sq m (data from the environmental assessment). 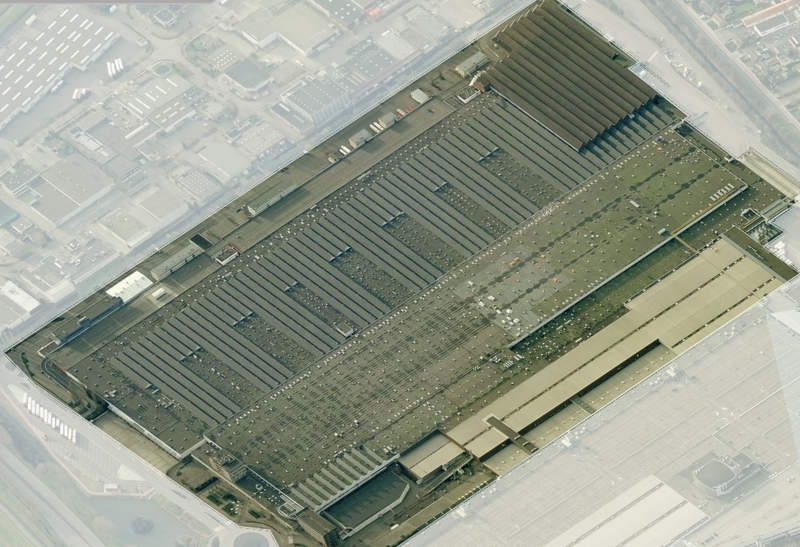 A million square meters is a large dimension, difficult to see “piled up” in a building. Beyond large stadiums, big box retail venues, and industrial or logistic buildings sometimes reach quite large dimensions with low heights; this is the case of some asian malls and of FloraHolland in Aalsmeer, the largest auction hall for flowers in the Netherlands, with a gross floor area of 990.000 sq m (one of the largest buildings in the world). 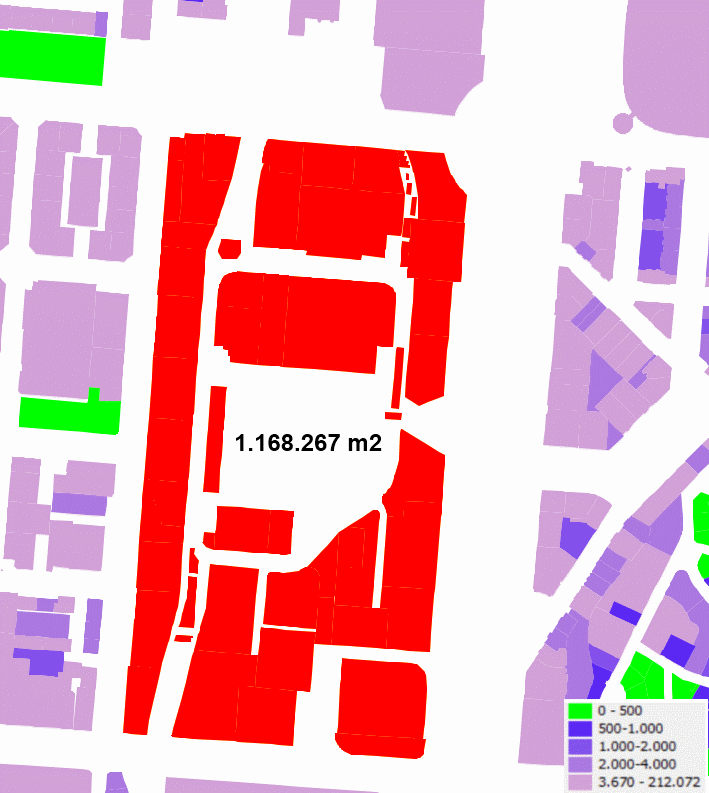 Reaching the million sq m category in other building typologies is difficult, as regulations and quality requirements usually favor a division of volumes. 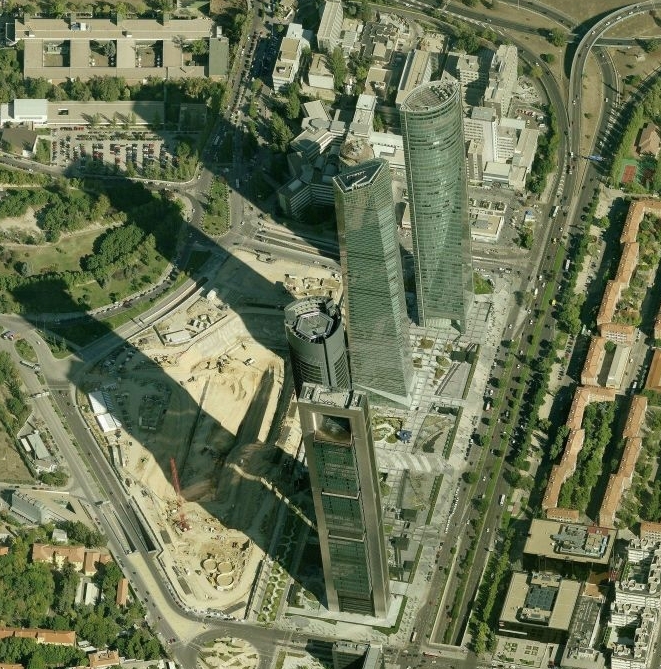 The Cuatro Torres Business Center in Madrid concentrates the four highest towers in the city, with a combined 486.159 sq m gross floor area on 30.000 sq m (four lots). But there is no need to articulate towers to design a huge surface building. 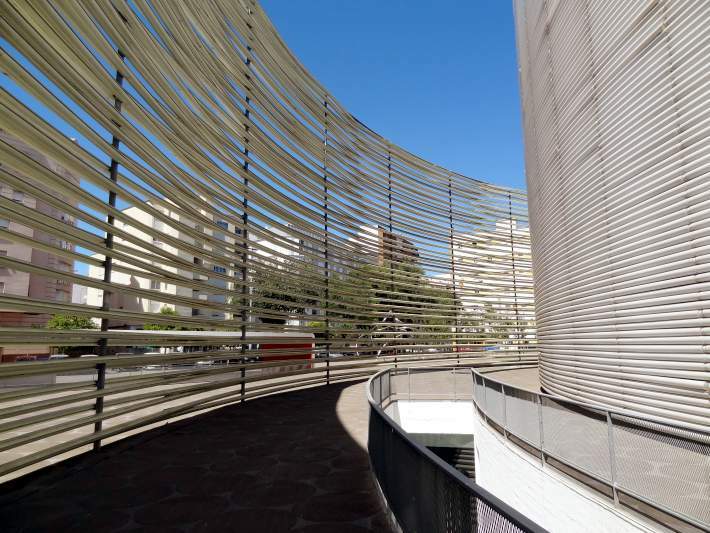 The mixed use (retail and offices) L’Illa Diagonal in Barcelona (Architect Rafael Moneo) sits on a 20.352 sq m lot with a gross floor area of 199.246 m2 (land registry data), with only eight floors above ground. 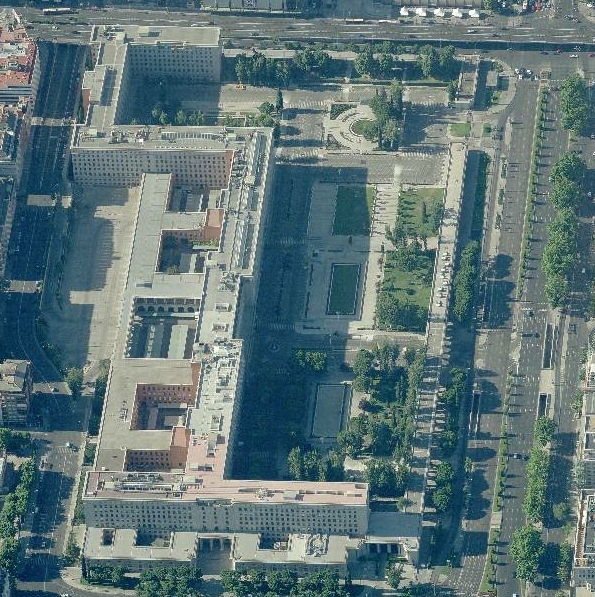 On a similar height range, but on a larger lot (116.223 sq m), the New Ministries in Madrid have a 184.396 sq m gross floor area (land registry data). 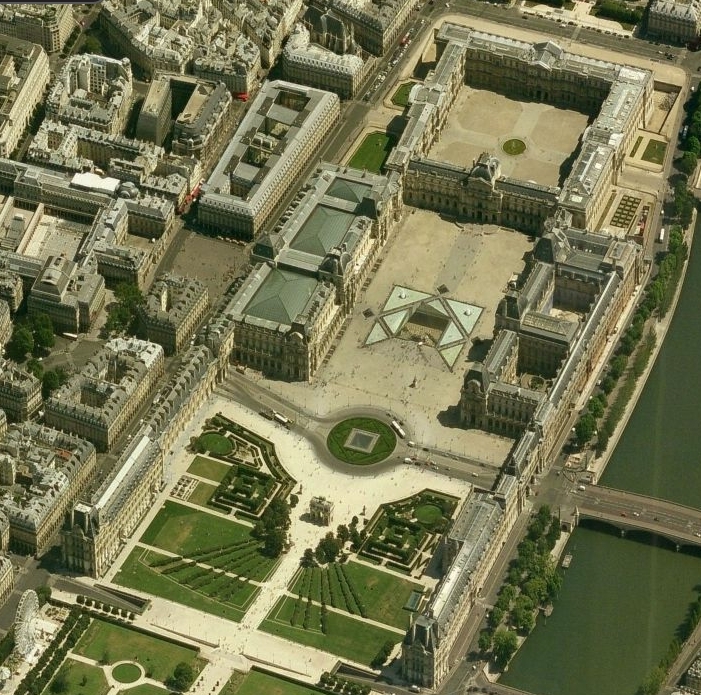 The Louvre Museum in Paris has a 200.000 sq m gross floor area (according to its greenhouse gas emission control plan). 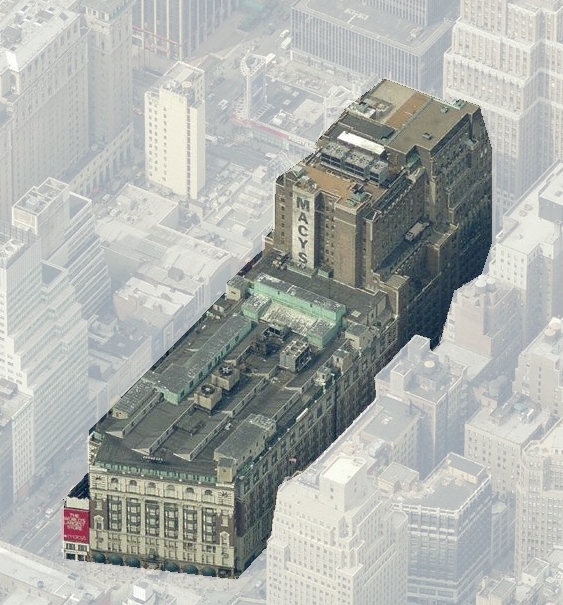 New York illustrates high densities: Macy’s East department store sits on a 12.483 sq m lot, with a 194.361 sq m gross floor area, resulting in a floor-area ratio of 15,6, and the Empire State Building sits on a 8.486 sq m lot with a gross floor area of 261.312 sq m (land registry data in both cases), resulting in a floor-area ratio (FAR) of 30,7. These FAR are possible with land uses with limited demands for natural lighting and ventilation, as in department stores or, in the second case, offices conceived according to what today are dated standards. The FAR concept itself cannot be compared without knowledge of the context: in Madrid’s four towers the FAR (measured on lot) is similar to that of Macy’s East, but in the first case towers have 50 levels and sit on a common basis, while in the second the building façade is aligned with the lot line with a maximal height of 19 levels. Management systems and operational budgets in projects concerning the creation or substitution of urban freeways vary according to local conditions and to the ideological orientation of government officials in place. Comparing the economics of this kind of projects in different countries and cities is utterly complex: exchange rates, differences in the materials and labor costs, accounting principles and technical requirements diverging, debt payment terms, inflation… Dividing the project in tranches and packages makes it even more complex, and unified data is scarce. Anyway, some conclusions from the three cases seen and some other. The cost of works in Europe is substantially higher than in emerging countries, as much for environmental or safety requirements as by the cost structure. According to a 2007 report of the Comptroller and General Auditor of India, the Bandra- Worli new construction project (5,8 km) had an estimated cost of 13,06 billion Roupies (about 200 million Euros). 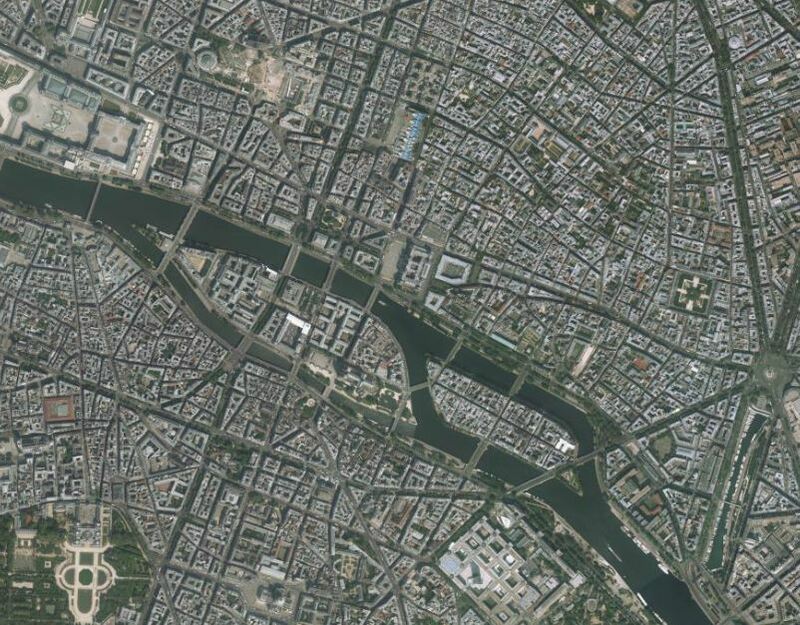 According to Paris city documents the covering of 10.000 sq m of freeway at the Porte de Vanves for less than 500 m of length had a cost of 58 million Euros. Nevertheless, taking into acount the average disposable income of local citizens, the situation is the opposite. Urban integration and underground works in Europe are on a similar cost scale per km. The higher technical complexity of the M30 tunnels in Madrid was compensated by a greater freedom in traffic diversion schemes layout during works, while the Boulevard Peripherique projects had to be executed with much less margin and over a functioning original right of way; the tunnel security rules create an increased cost, having to monitor a series of small tunnels instead of a long single one. The debt burden caused by these works varies. In Mumbai the Bandra- Worli Sea Link, a project of the State of Maharashtra, has been defined as a 30 years concession contract with a toll which should allow it to self-finance. Paris counts its costs in its general budget, without a separate chapter, and benefits from a strong participation by the central State and the Region Ile de France. 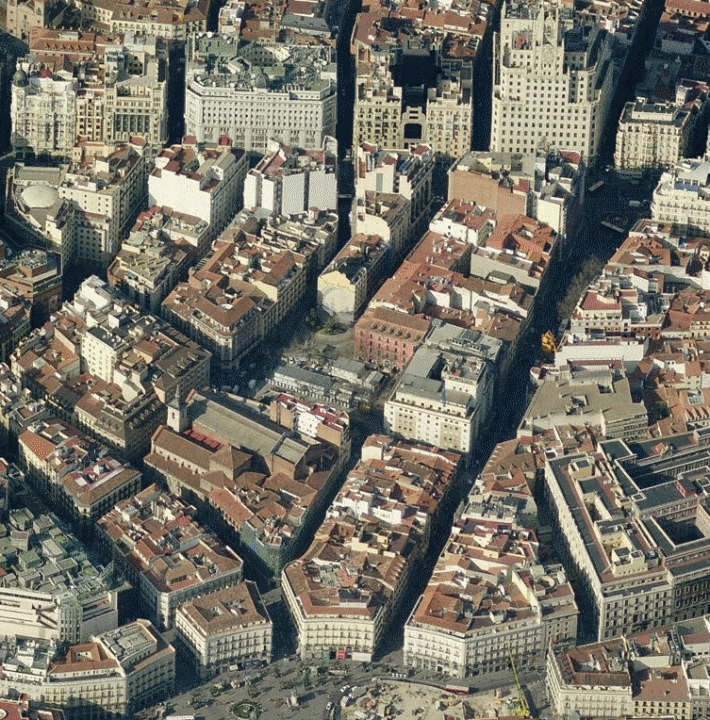 In Madrid the city alone bears the cost, having constituted a public- private partnership; Madrid Calle 30 (80% municipal) has a separate accounting scheme, showing that the debt caused by the project is slightly larger than half the added remainder of the municipal debts. The budget problems are not an exclusive of the right or the left; Boston’s Big Dig (similar in many instances to Madrid Calle 30) was an initiative supported by official from the Democratic Party, and in Mumbai the city and the State of Maharashtra have different governments.